I haven’t been here in so long I’ve actually forgotten how to post. I’ve been blogging for what, a decade? And I totally forgot the steps it takes to go from letterz to wordz to a coherent grouping of said letterz in order to form wordz. Truth is, I’ve been really busy getting divorced, which is why I’ve not been forming wordz with letters talking about bookz and writerz and other crazy thingz. I’ve also apparently picked up some sort of letter impairment, in which I’ve confused zs and ss. Essesss. Zeeees. Hard to write that without improperly using apostrophez. Suddenly, I’m almost identifying with people who don’t know how to punctuate correctly or who take the easy way out when the going gets tough. But not quite. I still judge you by your grammar and punctuation. Spelling, too, because COME ON THERE’S SPELL CHECK. It’s important to note I have been reading. It wasn’t so for a while but recently I’ve remembered how to do at least that with wordz. And though it doesn’t make much difference in the world, I will soon come back to talk about all the bookz I’ve been reading, which is actually a pretty fair number. Because, hell, I’m not working so what else do I have to do with myself right now? Drape myself over the sofa, personifying the word LANGUID, that’s what. And while that’s really pretty fun to do for dayz and hourz and weekz on end, my doctor tells me that, at some point, I should probably get off my azz. So, yeah. Divorcing and moving and not working a paying job. Splitting belongingz and moneyz and all the fun thingz you do when you split up a marriage of 25 yearz. Then there’s also weeding my book collection by an astonishing amount, as my apartment is not a very big 3-bedroom house. It is a decent-sized 2-bedroom space. I’m not even sure the building codes allow for as much weight as my full collection of bookz would have required, plus, when your belongings reach a certain critical mass it’s like they own YOU, not the other way around. 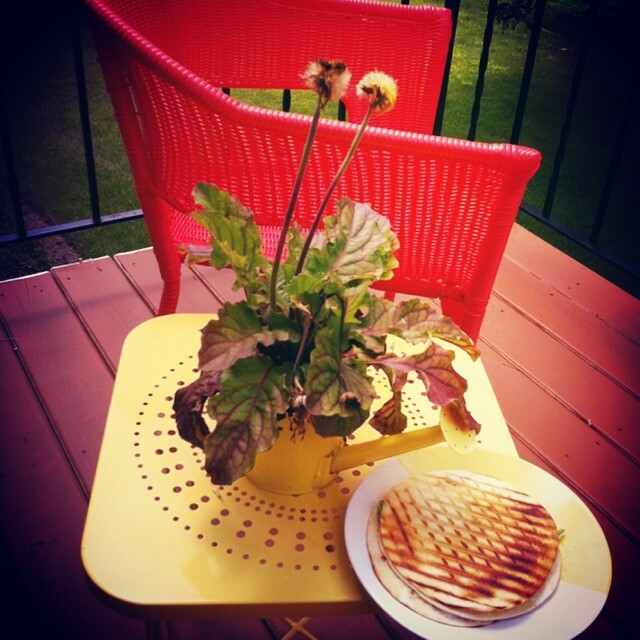 This iz my balcony and this was my lunch: spinach and pepper cheese quesadilla. It waz good. No, THIS ONE! HERE! RIGHT HERE! Sounds like you need some friendz and some red medicine.